USA Region Wall Maps from Omnimap. 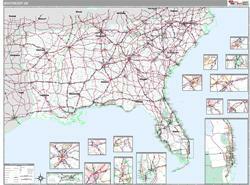 The USA Region Premium Style Wall Map is an attractive display wall map with complete map detail. It is an ideal choice for applications that benefit from both a colorful display and full reference information. The Premium Style Wall Map features highway detail as well as colorful shadings of populated places. This map comes laminated using 3mmm hot lamination, which protects your wall map and allows you to write on it with dry-erase markers. The map is available with several different mounting and framing options - see below. Three-sheet USA regional series - East, Central, West regional maps. A thumbnail image of the USA West region wall map. A thumbnail image of the USA Central region wall map. A thumbnail image of the USA East region wall map version 1. A thumbnail image of the USA East region wall map version 2. Six-sheet USA regional series - Nothwest, Northcentral, Northeast, Southwest, Southcentral, Southeast regional maps. A thumbnail image of the USA Northwest region wall map version 1. A thumbnail image of the USA Northwest region wall map version 2. A thumbnail image of the USA Northcentral region wall map version 1. A thumbnail image of the USA Northcentral region wall map version 2. A thumbnail image of the USA Northeast region wall map. A thumbnail image of the USA Southwest region wall map. A thumbnail image of the USA Southcentral region wall map version 1. A thumbnail image of the USA Southcentral region wall map version 2. A thumbnail image of the USA Southeast region wall map version 1. A thumbnail image of the USA Southeast region wall map version 2. A thumbnail image of the USA East region wall map. Samples of states individually colored and samples without individually colored states. A thumbnail image of the USA Southeast region wall map without individually colored states. Sample detail from the USA Southeast region wall map without individually colored states. A thumbnail image of the USA Northeast region wall map with individually colored states. Sample detail from the USA Southeast region wall map with individually colored states. Whether or not you want zip code boundaries on the map. Any framing or mounting option, if necessary. Any frame color option, if necessary. (2 x 3 ft) 36 x 48"
(3 x 4 ft) 48 x 64"
(4' x 5'4") 60 x 80"
(5' x 6'8") 72 x 96"
(6 x 8 ft) 90 x 120"
(7.5 x 10 ft) 108 x 144"
Laminated. The laminated maps are laminated on both sides using the highest quality 3 mil hot process. Lamination is available in all sizes, up to 9 by 12 feet! Use your dry erase markers and Mark-It Dots directly on the wall map! The basic laminated wall map is not mounted, but can be rolled and stored in a tube. Wooden Rods. Wooden Rails are the perfect accessory for adding a warm, classic look to your Wall Map. A solid cherry-stained wooden rail is soundly attached to the top and bottom of your map. A rugged cord makes it easy to hang and to proudly display your Wall Map! ReSticker. Just peel and stick! Taking mapping technology to a further step, MarketMAPS.com introduces Map ReStickers! ReSticker maps are printed on Photo-Tex, a new self-adhesive fabric paper that resists water, wrinkles, and rips. With this innovative technology you can stick your maps directly to walls without using screws, nails, tape, rails, or glue! Pull off and re-stick time and again. Mounted and framed basic. Great for a professional look, our basic frames are made with 1 inch thick pine wood and available as unfinished wood frames or in black stain wood frames. Your wall map is protected with a quality lamination for long term use, maps are mounted on sturdy foam board and then framed. Available in 2 finishes: Unfinished or Black. Specify color in the "Comments" section at checkout. Mounted and framed - executive. Great for a elegant and refined look, our executive frames are made with 1 inch thick wood and available in cherry, light oak, and dark oak stain finishes. Your wall map is protected with a quality lamination for long term use, maps are mounted on sturdy foam board and then framed. Available in 3 finishes: Cherry Wood; Dark Oak; Light Oak Wood. Specify color in the "Comments" section at checkout. Magnetic mount - plastic frame. Magnetic Wall Maps are useful planning and tracking tools. Use magnetic markers and symbols to track customers, delivery points, service centers and much more. Framed in a soft line black plastic frame. Magnetic mount - basic wood frame. Same frame as basic frame above. Available in 2 finishes: Unfinished or Black. Specify color in the "Comments" section at checkout. Magnetic mount - executive wood frame. Same frame as executive frame above. Available in 3 finishes: Cherry Wood; Dark Oak; Light Oak Wood. Specify color in the "Comments" section at checkout. Unfinished wood frame. This is an unfinished wood frame that you can stain any color you wish. The map comes mounted and framed, so painting the frame requires a steady hand.